Amelia Uzategui Bonilla is a dance artist and educator who regularly performs and teaches in the United States and Peru. 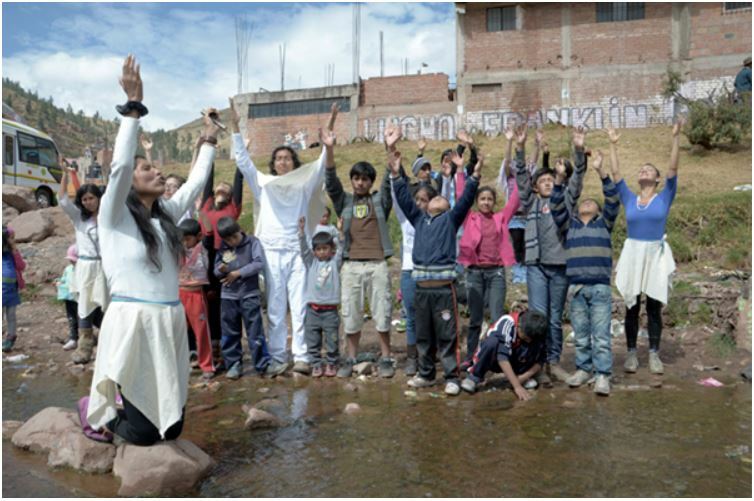 In 2013, she founded the Río Danza Comunitaria in Peru, an organization that protects water rights through community performance and arts education. Now in the midst of a master’s program in Germany, she continues building her passion for arts education, performance and social justice. Can you share a bit about your dance history? What are some key moments or inspirations that have shaped your path? I attribute my entry into dance to my mother. My mother is a traditional Peruvian dancer. She danced her whole life, and in her adult years, she was able to train at what is now the José María Arguedas School of Traditional Dance Practices in Peru. We immigrated to the United States when I was about 18 months old. My earliest memories include watching her practice. She has a memory when I was very small of asking if she could teach me, and I responded “I already know how. I want to watch you.” It points to something I’ve always loved in dance: watching and providing space for others. My mother suggested I take ballet classes starting when I was seven. I trained with Meredith Baylis until I was 17, which is how I managed to receive sufficient training to get into Juilliard. I didn’t have the “ballet body.” My teacher had been a Ballet Russe de Monte-Carlo dancer, and had travelled to South America on tour. She understood where I was coming from and could foresee my career wouldn’t be solely as a performer. At about age 15, I began to direct and organize recitals and studio showings for friends and family. I saw dance as something that was serious and exciting. I didn’t have the opportunity to go to an intellectually stimulating high school, although I got good grades, so I found my stimulus in dance. There weren’t any grades, but there was always room for improvement and discovery. I graduated from Juilliard in 2007 and did freelance work in New York for three years. There weren’t a lot of options for someone who looked like me, regardless of my skill, and I got that right away. I travelled back to Peru in 2005 for the first time. My family hadn’t visited when I was a child because there were hard moments politically and economically in Peru in the late 80s and 90s. While visiting, I had a chance to meet a woman who was a pioneer of Afro-Peruvian dance and theater, Victoria Santa Cruz. We had many conversations over the course of several weeks, and she changed my life and perspective. It was hard to go back to Juilliard after that. What I was looking for wasn’t in that trajectory. I wasn’t interested in dancing for a rep company, and there weren’t a lot of people who looked like me in those companies. I worked with an artist, Tino Sehgal, who suggested I go to Europe. That’s where I saw a reconstruction of Anna Halprin’s famous piece Parades and Changes. I went to Europe to seek the avantgarde but was moved most by a piece that was made decades ago in California. That was the same year that Breath Made Visible came out, the documentary about Anna. I saw Anna speak, and she inspired me to move to Peru. I had wanted to live in Peru for a long time but didn’t have the courage to do it. New York City has an attitude that if it doesn’t happen in New York, it doesn’t matter. Anna had moved to San Francisco at a time when there wasn’t a lot going on there. So I moved to Peru. I had to ask myself: What does it mean to be a Peruvian person? I understood that my body represented something when other people looked at it, but I myself didn’t have a lot of embodied knowledge. For all I knew, I was American, but I wasn’t always treated as American. I was often assumed to be an international student at Juilliard. Four and a half years after moving to Peru, I moved back to California and did the leadership training at the Tamalpa Institute. My mom got cancer, and it shifted my priorities. I wanted to be closer to her, so I went back to California. 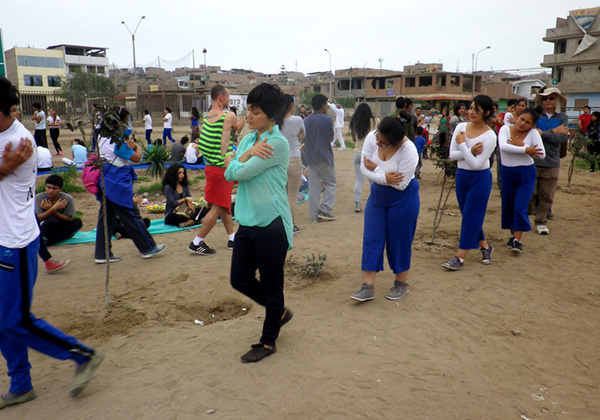 There was a short workshop happening in nature through the Tamalpa Institute, and it made sense to take it because it was part of my interest already, especially after initiating the Río Danza Comunitaria in Peru. I did the workshop with my mom, and it was four days at Pt. Reyes. It was a dance workshop like none other because it was so inclusive; my mom and I both had wonderful and unique experiences which one workshop could contain. My mom encouraged me to do the leadership training. Currently, I’m in Frankfurt working on a masters. I’ve spent the past half year researching William Forsythe’s improvisation technologies. Forsythe was based here in Frankfurt for 30 years. It was part of an assignment for my program to research a particular technique through literature and multimedia. I was using the improvisational technologies CD, which is luckily all on YouTube now. I also interviewed several of the former Forsythe dancers working in the region. I researched six former Forsythe dancers, putting together a different idea of Forsythe’s technique and work than I had from my exposure to his work in New York. At Juilliard, I got the message that I wasn’t a Forsythe-type dancer, and I wanted to question that message – why did I think that? This inquiry has informed and motivated a renewed interest in my own dance practice, especially questioning tradition. This has been hard for me; I learned the techniques of revered American modern dancers in a way that was the most authentic possible, from someone who had performed with the company. Those techniques were presented as something that can’t be messed with or played with. Forsythe really challenged those questions. He used ballet, but his improvisational tools could be applied to any tradition. I’ve been applying it to Afro-Peruvian dance and my own phrases. Can you tell me a little about the Río Danza Comunitaria and how it came about? 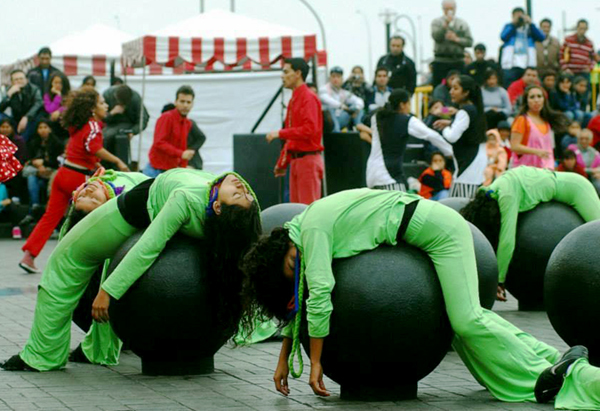 One of my colleagues in Peru found out about Global Water Dances and organized it in Lima in 2011. In 2013 when it happened again, I decided to lead it, as my colleague had moved. I decided to use it as an opportunity to bridge communities of different dance genres to focus on economic water injustice. There are still parts of Lima that don’t have running water. They pay more per liter of water than richer folks who can get it from the tap. What really surprised me was that over 100 people got involved. I got support from the university where I was teaching, as well as through the municipality of Lima. The mayor at the time had a daughter who was a dancer, so she supported dance. Our costs were covered in terms of presenting the performance in a public space. Afterward, 11 dancers came up to me either individually or collectively and wanted to continue. They asked me, “What’s next?” The Río Danza Comunitaria was born as a collective that takes dance with the theme of water into spaces that don’t usually have access to dance. I left Peru as a result of my mom getting sick, and as part of the transition, the collective developed written projects together. We were looking for ways of applying what we had learned from the initial project and expanding upon it. We traveled to Cuzco, where there is a significant community of healers and shamans who live in the sacred valley. Several of them participated in our project. This was a huge learning opportunity, as they have a profound and deep knowledge and tradition. That traditional Andean connection to nature shaped my understanding of events like the controversy over the Dakota access pipeline. There’s an ancestral knowledge that water should be protected. The Río Danza Comunitaria has slowed down in the past year. They have led and continue to lead many artistic and educational activities, including consistent and multi-city participation in the Global Water Dances project in 2015 and 2017. It’s the economical piece that frustrates the project from growing as many invitations for Río Danza’s participation are not remunerated. I imagine it speaks to a larger, world-wide issue on the lack of value given to cultural labor. What are some of the effects or results you’ve seen come about from the Río Danza Comunitaria? It really helped to foment some courage for dance leadership, and particularly spurred interest in projects that make contemporary performances based on Peruvian traditional practices. Members of the collective continue to offer free decentralized workshops outside of the wealthier parts of Lima. The model has been replicated in different communities, including in impoverished beach towns south of Lima. One project leader developed a project in her hometown, and has been hosting Global Water Dances since 2015. She’s encouraged other members to continue educating themselves and stepping into their own power. Can you share a little about your performance practice, particularly your recent solo Sin Adjetivos? Sin Adjetivos is about being consequent with myself. The title is from a quote by Victoria Santa Cruz, and it refers to a concept she stressed: being dedicated to something without an adjective in front of it, to be present in the moment without a warmup, without an adjective. My understanding of it has to do with going back to how I’m viewed. I realized that in Peru I didn’t have to explain where I was from; I was accepted as another Peruvian person. Even in liberal San Francisco, I had all these adjectives and expectations to deal with. My work as a Peruvian female immigrant artist had all these adjectives attached. I really wanted to explore what it would be like to perform without adjectives or playing the role of the other. It’s still something I don’t have a clear answer to. It has to do with the allowance to take from all my experiences and heritages, from Europeans who colonized, Africans who were forced, and Natives who survived, as well as my identity of being a woman. How do I let all that be without it being a mask? How would you characterize the dance scene in Peru? Peru equals diversity and history. For economic and sociopolitical reasons, it has been isolated. In general, Latin and South American countries are isolated from each other; there’s not a lot of travel in between, even in dance communities. There’s not a South American dance festival because there’s so much instability within the individual countries. What we do have is a rich history of traditional practices that are similar to what my mom experienced and studied. I’ve had a chance to witness and be a part of my mother’s dance world. I was expecting this from my conversations with Victoria. What I wasn’t expecting was the boom of hip hop dance. In the 80s, young people taught themselves from VHS tapes, and now they teach each other the newer styles from the internet. They educated me on popping, locking and breakdancing. I participated in a dance company that was commercializing this phenomenon. It was great to recognize Lima as an urban center of an arts movement. What I did notice about Lima’s dance community was that it was quite separated – the contemporary dancers were together, the ballet dancers were in their own institutions, then there was the traditional dance school my mom did her training in, and there were the urban dancers on the street. There was so much great dance happening, but it was all spread out. With Facebook becoming more popular in Lima, I was able to find out what others were doing. I had a studio practice while I lived there where I would offer workshops, which ended up being a convening of dancers from different areas who were interested in what I had to offer. How do you hope to use your masters to add to the work you’ve already been doing? I’ve been going back in forth in varying directions. I always wanted to go to grad schools but didn’t find the economic possibility to do so. It’s taken awhile to get here. I’m very happy with my program. I see it as an opportunity to become a more well-rounded dance professional in terms of learning critical discourse, theory and writing. I didn’t have access to those skills in my practice-oriented bachelor’s degree. Studying abroad with international classmates, there’s the idea of cultural translation. 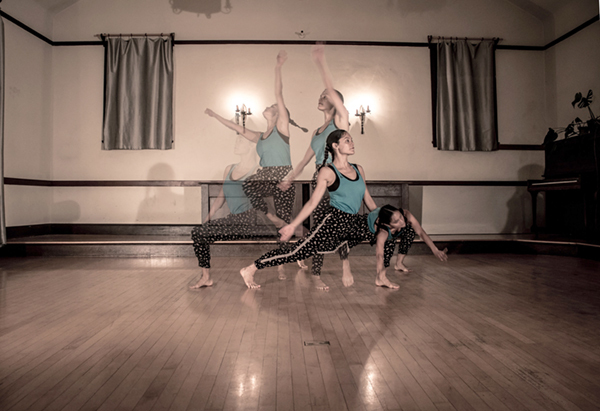 So often, dance communities become insular with the dialogues they are having. I’ve seen this in myself, that it becomes difficult to critique the work of artists I love and know. It’s important to find ways to process and synthesize information so that it can be transmitted in a way that is culturally diverse. For example, when I talk about issues of race in Germany, I have to paint a different panorama than in the US where we all know what we’re talking about. I’ve come to appreciate that because it doesn’t take anything as a given; there’s no common knowledge we should or shouldn’t have. What are the important references and who is the audience? This helps provide the links and entry points into the physical practice. Of course, Anna Halprin has been a huge influence on my life. Last time I was in the Bay, she had this advice: Keep doing what’s fun. That’s something I’m grateful for, meeting artists who keep me growing and developing. It’s something I know I deserve and I believe all of us deserve. And I hope to provide those containers for the artists of tomorrow. To learn more, visit ameliauzategui.com.